Good news! Last night at Target I discovered that one of my all-time favorite historical novels has been repackaged and is out on bookstore shelves again. (And it’s a Target pick!) 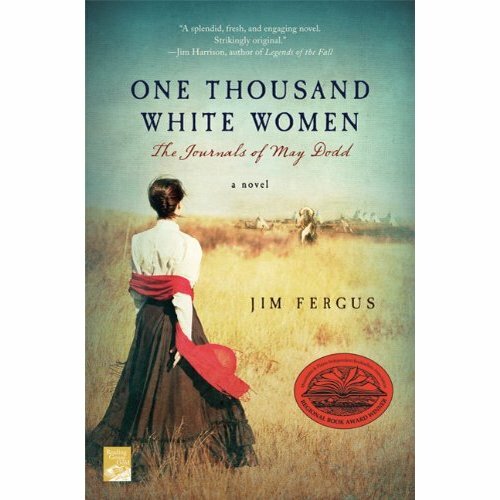 That book is: ONE THOUSAND WHITE WOMEN: THE JOURNALS OF MAY DODD by Jim Fergus. Fergus found a juicy piece of history to base a story on when he came across a reference to a proposal the Cheyenne Nation made to the U.S. government in the late 1860’s. Based on the way Native American tribes assimilated other groups into their society, the Cheyenne believed that if the U.S. government would send a delegation of a thousand white women west to intermarry with Cheyenne men, the offspring from these marriages would form a society prepared to live together in peace. Taking that proposition, Fergus plays “what if.” “What if” the government, as an experiment, was willing to send a group of women west? “What if” they solicited women to volunteer for this project, knowing they would marry Cheyenne men? Who would these women be and what kind diverse reasons might they have for signing on for what might be a very dangerous mission? “What if” one of the women ultimately selected kept a journal of her experiences? ONE THOUSAND WHITE WOMEN takes the form of May Dodd’s journals, which encompasses the observations and musing of a brilliant outcast and fearless adventurer over several years. With insight and humor, she tells not just her own story, but of the stories of the other women who braved the frontier for a chance at a new life. I love this book: especially the intimacy of the journal format and the tension that lies between the idealism of this endeavor and the real history of the period. But most of all I love May and the women Fergus creates to tell this improbably story. I’ve read it twice, given it to friends and recommended it to my book group. It’s a compelling story and delicious read– one that begs to be read again and again. Just telling you about it has made me want to move my dog-eared copy to my nightstand so I can read it again — toward the top of the towering pile of books already there. I thought this weekend in Monterey, California looked like fun – well, at least fun for someone who loves history like I do and has a rampant interest in art. It seems to me like a very cool chance to go inside not just the adobes – which have fascinated me since I was a child – but to see paintings from a period of art that is not only beautiful, but which often provides the best record of a way of life that has long passed away. In the late 19th Century, some of California’s greatest artists lived in Monterey. This fall will see the debut of Art in the Adobes, an important new cultural festival that will bring Monterey’s hidden artistic heritage back into the light. One of the most beautiful of these hidden treasures will be on display: “Kitty, Sonoma” by renowned painter Charles Rollo Peters, who lived and painted in Monterey from 1894 to 1909. The art will be displayed in many of Monterey’s historic adobes, including the former home of Robert Louis Stevenson. The festival will run the weekend of September 30 – October 2, 2011. I’m going to do my best to attend the “Art in the Adobes” weekend, and I hope those of you who are close enough will consider doing the same. BTW, “Kitty, Sonoma” appears to be a painting of Charles Rollo Peter’s wife Kathleen, who is buried in the cemetery in Monterey. I wrote a piece on her here on the website a year or more ago, and I think finding her memorial is one of the reasons I became interested in California art. I am just back from the Historical Novelists Society conference in San Diego, and thought this might be a good time to let you know that I am still researching, working on books, and enjoying the process. I came back from the conference energized. It was great spending the weekend with about a hundred other history geeks talking about writing and books. One of the things that I was thrilled by was being able to hear one of my writer heroes, Susan Vreeland (THE GIRL IN HYACYNTH BLUE), talk about her work. I read two of her earlier novels THE FOREST LOVER and THE PASSION OF ARTEMESIA, in preparation for hearing her speak and was glad I did. Since I am incorporating more historical characters in the novels I am working on and using them in larger roles than ever before, I had been struggling with how to deal with the parts of these real people’s lives that are not documented. Or in other words: how much can an author make up? How do you take two or three or four incidents in a person’s life and believably weave the life that comes between them? Vreeland did a great job of talking about how she does this in her novels: by pursuing certain themes in the lives of the characters, by leaving out extraneous material and characters, by focusing on the things in a historical figure’s life that reveal the most about who she thinks they are. There’s more on her website about this, if you’re interested. I also picked up and asked Susan to autograph a copy of her most recent novel, CLARA AND MR. TIFFANY. What I mean to do here in the next weeks and months is let you in on what I’m working on, some of the research I’m doing, and how I grapple (or not) with the real and fictional characters in my work-in-progress. If you’re interested in any of that I invite you to check back on how I’m doing. If you’ve got an opinion you’d like to express on any of this, feel free to contact me. Also as a reminder, MOON IN THE WATER by Elizabeth Grayson and A SIMPLE GIFT are available on Amazon. 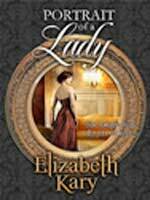 Two of the novels I wrote as Elizabeth Kary, PORTRAIT OF A LADY and LET NO MAN DIVIDE are available in e-book formats on AWritersWork.com. Hope you’ll stop back in when you can to share my adventures. It feels good to be back. Writers write, that’s how we define ourselves. But writers also talk, and when a group of us got to visiting at a conference, the conversation came around to how often we get requests for books that readers simply can’t find. Some of them have lost their “keepers” in moves, lent their comfort reads to friends, or mistakenly put the crucial book in a series in a box for the library sale. The frustration we heard in our readers’ emails got us thinking – and the solution we’ve come up with is to make some of those special books available at a new website, AWritersWork.com. We authors will be offering the books you want in e-book and PDF formats, because while the stories are as good as you remember, technology has changed. AWritersWork is starting up with contemporary favorites like Pat McLinn’s THE GAMES, historical romances like Lori Handeland’s powerful DREAMS OF AN EAGLE, short stories from Kathy Lynn Emerson’s FACE DOWN mystery series, and Jasmine Cresswell’s blood-curdling paranormal, PRINCE OF THE NIGHT. AWritersWork is also offering books exclusive to our website, like LOST LOVE, Patricia Rice’s anthology of novellas, and Karen van der Zee’s non-fiction work, YOU’RE MOVING WHERE? 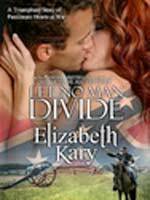 And while my contemporary novel, PORTRAIT OF A LADY, and bestselling historical romance, LET NO MAN DIVIDE, are ready for you to pop into the shopping cart, the entire set of Elizabeth Kary novels should soon also be for sale at AWritersWork. In the months to come we will be adding new authors, new books, and new categories of fiction, non-fiction, and eventually original work from our published authors to the website. So please, when you visit there, bookmark AWritersWork.com and stop back often to see what’s new. We’ve created AWritersWork just for you. It’s a place where we as writers can share stories we’ve loved telling with readers like you who’ll love reading them – either again or anew. And just in case you’re wondering who Elizabeth Kary is, you might know me better by one of my other pseudonyms: Elizabeth Grayson or Karyn Witmer. All three of us hope you’ll stop by. Avery Montgomery’s life changed forever in the check out line at the Food-4-Less when she discovered her long-lost daughter, Fiona, working at the next register. Though Avery tried to reestablish contact, Fiona has secrets and failures she can’t bring herself to share with her mother—and especially her father. P.S. The coolest thing recently happened. I received an invitation that gave me a chance to chat, meet new friends, and talk about A SIMPLE GIFT at the regular meeting of the DFWTea Plano Book Club. But I didn’t have to worry about high airfares and crowded planes; I did it by telephone! This innovative way to add the author’s voice to book discussions is apparently sweeping the country. 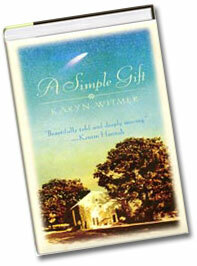 If your book club is interested in having me stop by to discuss my Literary Guild pick, A SIMPLE GIFT, you may contact me here.